Welcome to another la-la land club kit post. 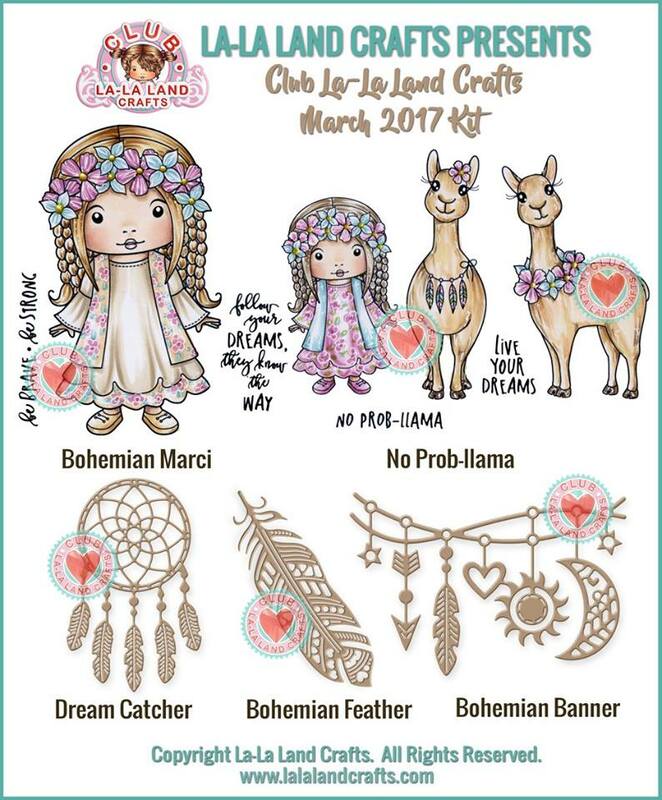 Today I'm showing you my projects made with March club kit. This kit is all about dreams and llamas. I made two cards with this kit. On my first card I used stamps from No Prob-llama set. Images were coloured using Distress ink pads. I used all three dies from the kit on this card. Papers used are from Maja Design and flowers from I am roses, as usual, right?! I coloured these three cute llamas and then fussy cut them and put on the card. I didn't mask them together because I wanted some dimension on this one. My second card is very clean and simple but it took me forever to make it, because colouring with Distresses takes time and these images are quite big too. I masked together Bohemian Marci with both llamas from No Prob-llama set. I added the "No Prob-llama" sentiment from the same set. Papers used on this one are from Echo Park.